Europe in Space was the theme for the 1991 Europa stamps issued by members of the Conference of European Postal and Telecommunications Administrations (CEPT). Great Britain, Guernsey, Jersey, and the Isle of Man each produced their own sets, as did Éire. All are shown below. These four stamps, joined in two pairs, honour the work of European astronomers at the Roque de los Muchachos Observatory on La Palma in the Canary Islands, where the UK plays a major role. Contributing to the pan-European spirit behind the issue, the stamps were designed by a Belgian artist, Jean-Michel Folon. According to the Royal Mail, they were meant “to set minds wondering about the mysteries of space”. The 22p pair is intended to convey the idea of looking out into space while the 37p pair supposedly suggests someone looking back at us. An eye on each stamp symbolizes the exploration of space. The abstract nature of these stamps will have intrigued and baffled in equal measure. For its 1991 Europas, the Channel Island of Guernsey linked events in space with local happenings on the island. Looking back to 1846, the first stamp recalls Queen Victoria’s visit to Guernsey in the same year as the discovery of the planet Neptune. 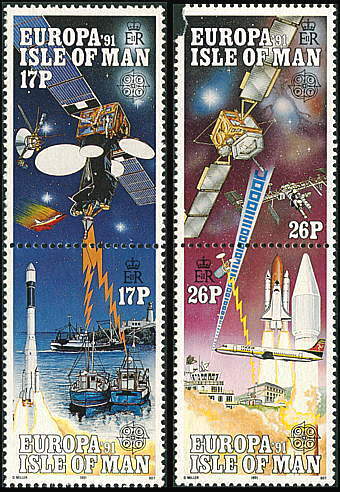 The second stamp commemorates a visit by Queen Elizabeth II and Prince Philip to Sark (a smaller island in the Bailiwick of Guernsey) and the launch of Sputnik 1, both in 1957. Events in 1961 recalled on the third stamp were the maiden voyage of the ferry Sarnia and Yuri Gagarin’s first manned spaceflight in Vostok 1. 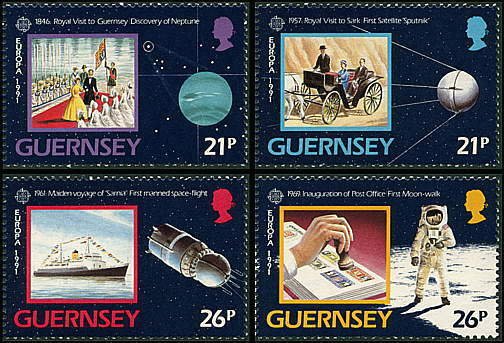 Finally, 1969 was the year in which Guernsey became a separate postal administration and issued its own stamps, and also the year of the first Moon landing. The Isle of Man also combined the space theme with local views on its two pairs of stamps, joined to form a composite image. On the 17p pair we see a satellite communicating with fishing boats in Douglas harbour. To the left is the launch of an Ariane rocket while on the upper pane is a space probe (looks to me like Voyager) and a Shuttle re-entry. The 26p pair shows two more satellites, this time communicating with Ronaldsway airport and Manx Radio. Also shown is a Shuttle launch and the International Space Station. 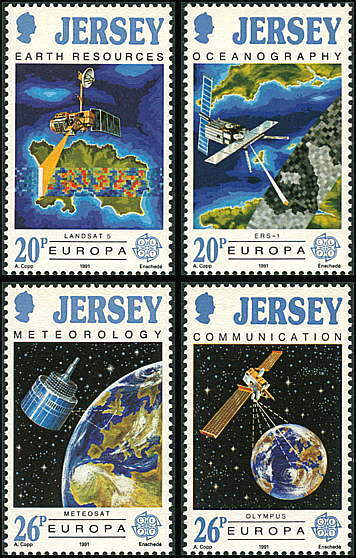 The Channel Island of Jersey produced four stamps illustrating different aspects of the uses of space. The first, headed Earth Resources, shows the Landsat 5 satellite scanning Jersey with its Thematic Mapper. On the second, headed Oceanography, the European ERS-1 satellite is seen scanning the seas around Jersey, while in the third, headed Meteorology, the European Meteosat weather satellite is seen looking down on the Earth, The final stamp, headed Communication, shows the large European Olympus satellite linking the globe. Ireland deserves a special mention for its 1991 Europas, which depict the Giotto space probe approaching Halley’s Comet and the Hubble Space Telescope. Ireland contributed to both these missions through its part in the European Space Agency. Among all the 1991 Europas, there were few better than these two realistic and skilfully drawn stamps.